Two years into the Trump administration, communities of color — and anyone using financial products, for that matter – are losing hope of finding an independent, dogged champion in Trump’s iteration of the Consumer Financial Protection Bureau. 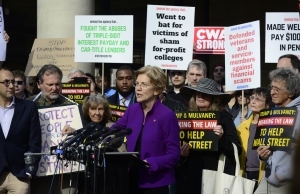 A brain-child of Senator Elizabeth Warren, CFPB was originally designed to protect consumers from fraudulent and abusive financial actors as a response to the 2008 financial crisis. 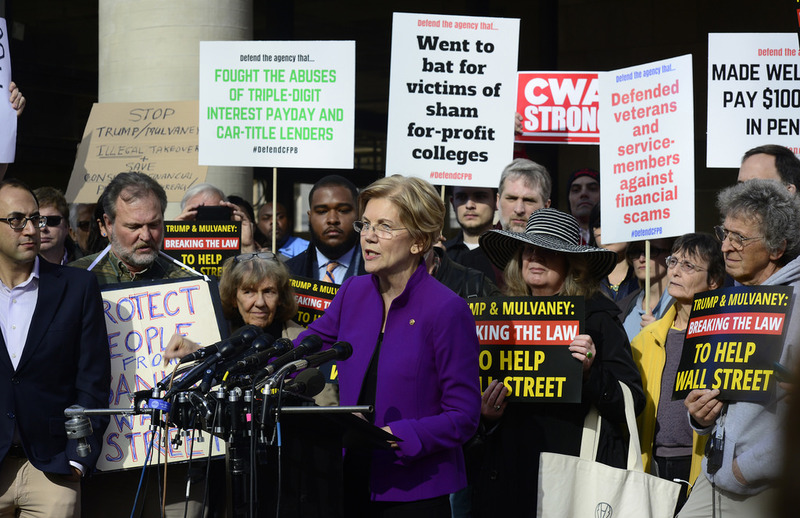 In gutting the CFPB and corrupting its mission, the Trump Administration disregards struggling families, and how the crisis brought our economy to its knees. And Trump’s latest move will make things even worse. According to the Treasury, the crisis cost taxpayers and our workforce approximately $20 trillion in lost household wealth, nine million jobs, and by some estimates 10 million lost homes and $14 trillion in taxpayer-funded Wall Street bailouts. By mandating the Bureau’s creation in the Dodd-Frank Wall Street Reform and Consumer Protection Act, the U.S. government sought to prevent another financial catastrophe by designing an independent agency to protect consumers by cracking down on unethical practices by banks, mortgage servicers, credit unions, payday lenders and other financial service providers. Under this mandate, the CFPB did just that. It reformed mortgage lending and loan disclosures, worked to close the payday lending debt trap, fined credit card companies like American Express and Discover for duping consumers, pursued payday lenders, protected student loan borrowers, explored the implementation of small business data collection, and secured almost $12 billion in restitution for 29 million consumers harmed by the financial industry. The Bureau’s vigilance and investigations were particularly important for consumers of color because it refused to be race-blind in its oversight. And for good reason: Ample research shows that people of color face modern redlining in the mortgage market, discrimination in auto lending and car insurance premiums, credit card redlining, and other barriers to credit. In short, the CFPB regulated in a way that was long overdue, placing consumer interest – including the well-being of consumers of color — front and center. Enter the Trump administration and Mick Mulvaney. With Trump’s appointment of Mulvaney as acting director, the people’s Bureau has been defanged and its mission undermined. Trump has called the Bureau “a total disaster,” and the “worst of Dodd-Frank” because “financial institutions have been devastated and unable to properly serve the public” (this “alternative fact” is completely fake, as banks have made near-record profits). Mulvaney, also Director of the Office of Management and Budget, called the CFPB “a sad, sick joke” and expressed disapproval of its existence. What’s the latest Trump administration ploy at internally dismantling the Bureau? His nomination of Kathy Kraninger for CFPB Director. This isn’t just a raid on the Bureau, but another frontal attack on communities of color. Kraninger currently oversees the Department of Homeland Security and the Department of Justice as Associate Director for General Government Programs at the Office of Management and Budget. She is believed to have likely been deeply involved in the Trump administration “zero tolerance” immigration policy that led to over 2,000 children being separated from their families. On top of these human rights violations, Kraninger completely lacks experience in consumer protection and finance. Democrats and consumers want answers. How seriously should we take Trump’s nomination of Kraninger? It’s unclear. On one hand, some speculate that nominating Kraninger, who reports to Mulvaney at the OMB, is a strategy to keep Mulvaney acting director until the end of Trump’s term as president. Mulvaney himself hinted at this. On the other hand, rumors have surfaced that Trump is considering Mulvaney for White House Chief of Staff. However Kraninger’s nomination plays out, Trump’s vociferous disdain for the CFPB and Mulvaney’s legacy of dismantlement from within signal bad news for communities of color and all consumers. We can only expect Kraninger, Mulvaney, or following nominees to continue setting the CFPB on fire. Congress needs to fight Kraninger’s appointment and Mulvaney’s acting directorship much like Republicans resisted former CFPB Director Richard Cordray’s Senate confirmation from 2011 to 2013. We expect nothing short of resistance towards an administration that rips families of color apart and encourages the scamming of consumers. Please urge your congressmembers to oppose the nomination of Kraninger and any other Trump CFPB nominee. You can phone the United States Capitol switchboard at (202) 224-3121. A lack of action will only leave us with another out-of-touch regulator at the helm, like Trump’s Office of the Comptroller of the Currency Appointee Joseph Otting. In a recent congressional hearing, Otting publicly testified that he has “never personally observed” racism in banking but “many of my friends from the inner city across America will tell me that it is evident today.” Let’s be very clear: this major banking regulator and enforcer of fair lending laws refused to acknowledge racism, denied the experiences of communities of color, and admitted to race-blind oversight. In our starkly unequal nation, the denial of racism is just as much to blame as racism in policy-making and lending itself. Sharon Velasquez is Greenlining’s Economic Equity Manager. Follow Sharon on Twitter.